I wanted to wake up early, to walk around the town before it gets too hot. But I had such great sleep last night that I put off waking up until past 8am. It wasn’t until 9:30 that I was able to leave Vilay Guesthouse. I walk down the road towards the Mekong, and walked parallel the main road, heading towards the town center. It’s interesting, these two roads. The main road is filled with shops catering to every tourist’s needs, while the road by the Mekong is quieter and have the stores where the locals shop. I turned right on the road leading up to the National Museum, but I passed it to head to the main road. 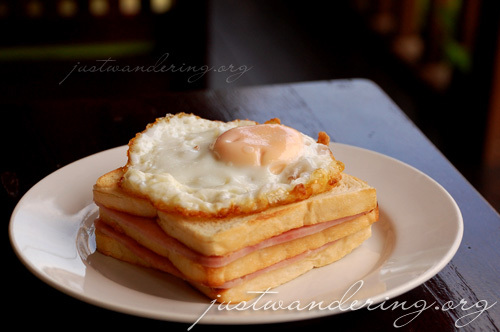 I’ve been eating local dishes for the past 7 days, and I’m hankering for some bread. Laos have been under the French rule decades ago, and seeing French baguettes being sold on the side of the road is a common sight. I’m not much of a baguette person though, so I settled on a Croque Madame, a sandwich with 3 white breads, slices of ham in between and topped with cheese and an egg. It was okay. Not as spectacular as the one I had in Melbourne (which comes with salad and the bread is practically covered with sinful cheese and butter). While I was waiting for my food, a girl approached me, selling random knick knacks. I politely turned her down, but she doesn’t leave. I take out my Pinkies and started taking photos. She was a really cheeky one, this girl. She was muttering “beautiful” when she saw the dolls, and after I’ve taken the photos, she asked to see them. When I showed the photo preview on my LCD, she keeps on saying “next” to see the other photos I’ve taken. She then started asking questions, about my name, where I’m from, when I arrived. She started selling her wares to me again, and this time, I bought one keychain from her. I have been intending to buy one of these (as per Chris’ request), so I figured why not? Besides, the price she’s giving me is the same price at the night market. My sandwich came and she runs off to try to sell to other tourists. I take my time eating my breakfast, and though I had a book in my bag, I didn’t feel like reading it. 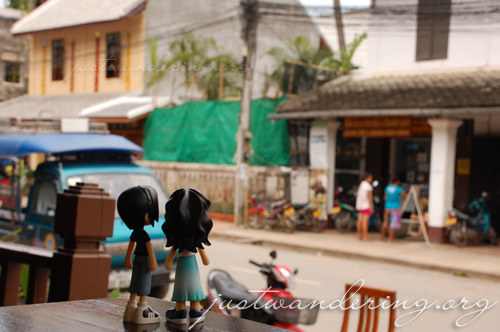 Luang Prabang is the sort of place that makes you just want to sit back and watch the world go by. I finish my sandwich, but spent 30 more minutes at the cafe just watching the people walking past. When the sun went behind a cloud, I took it as a sign to pay for my food and start walking. I walk back to the National Museum, intending to spend the hottest time of the day indoors. The main gate was closed, but the gate off the side was open. Just as I was walking up to the museum though, the grounds keeper saw me and shook her hand, indicating that the museum is closed. Oh well. I continued walking down the path to the Mekong again. There are restaurants overlooking the river where I see some locals eating, but I walk past them, since I’m still a bit full from breakfast. However, when I came upon this stall selling some grilled meat, I stop and pointed at a lovely piece of pork chop and pork belly. Each piece costs 20,000 kip, and one order of sticky rice is 2,000 kip. Not bad. I settled down to eat at this roadside carinderia, which is something I don’t really do even back in Manila. The rice was served in a small plate, and the meat in another. The utensils are inside a container and you just pick what you need to use. I get a fork and when I reached for what looked like a spoon, I discover that it was a soup spoon (the kind you use in Chinese restaurants). I used a pair of chopsticks instead. 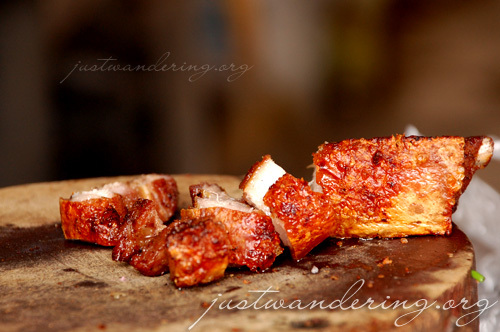 I pick up a piece of pork belly, and I can’t even begin to tell you how comforting it felt to bite into that yummy liempo. It was seasoned just right, and grilled nicely. It wasn’t perfectly tender, but it wasn’t tough or gummy either. It was just right. It felt so good eating something familiar, though it wasn’t the same eating it with sticky rice. Steamed rice is still the best with liempo, in my opinion. After lunch, I continue walking along the Mekong, stopping by the roadside to take a photo of a puppy across the street. 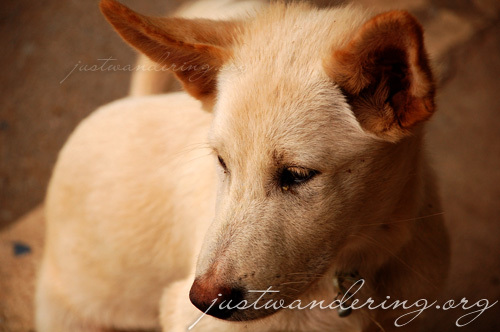 The puppy saw me taking photos of him, and he crossed the road and settled himself on the curbside beside me. Even the dogs are friendly in Luang Prabang. I enjoy the breeze by the Mekong for a couple of minutes more, then I got up to walk back to the main road. I came upon one of the Buddhist temples in town, and made my way up the stairs to the temple complex. There was nobody around, save for a cat walking around. 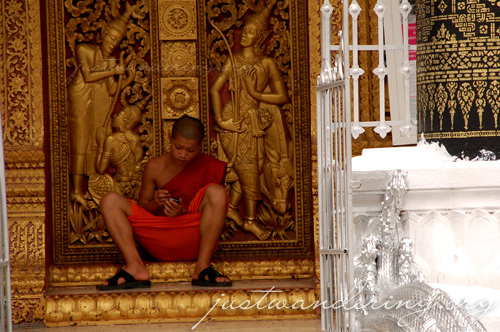 I walk up to the temple, taking photos, and realized that there was a young monk sitting on by the temple door using a cellphone. I think he was texting. I take a couple more photos and walked back down to the street level, and back to Vilay. Early to mid-afternoon was spent indoors, taking shelter from the midday sun. It’s also the best time to edit photos and write blog entries, as the Internet is still down (I’m doubting whether it would ever go online), and the Internet cafe closes at 9pm. It’s 5:30pm now and in a bit I’m heading out again, back to the town to check out the night market again. It’s going to be another early dinner, and plenty of time will be spent online, since I have to decide when I’ll leave LP for Vientiane. That texting monk is an interesting sight! at the texting monk. Parang may stylus pa siyang gamit. That liempo looks sooo yummy! And thanks thanks thanks for the keychain. I feel like such a… a “tourist” by comparison! Your photos are really nice, too! Chris: Sowzi ang mongha! Tinalo ako!